Battery Wharf Hotel's waterfront restaurant offers New England dishes with locally sourced seafood. : Battery Wharf Grille (formerly Aragosta Bar + Bistro) is the Battery Wharf Hotel's waterfront restaurant. 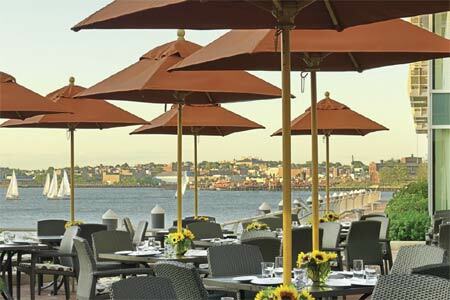 During the warmer months, be sure to request a table on the patio for al fresco dining overlooking Boston Harbor. Expect New England dishes with a Mediterranean twist --- think lobster ravioli with saffron cream sauce or Georges Bank scallops with parsnip purée. Other options might include roasted cauliflower with toasted Israeli couscous, rib-eye steak and a chicken BLT sandwich.